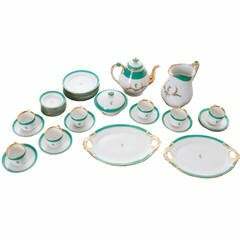 This lovely 19th century French Old Paris porcelain partial dinner service, circa 1860s, would complement most collections of Old Paris dinnerware beautifully. Each of the 95 pieces is banded in rose, a shade considered neutral in terms of Old Paris color palettes, and monogrammed with a vertically conjoined “SL”; some pieces are marked “M & D” verso. 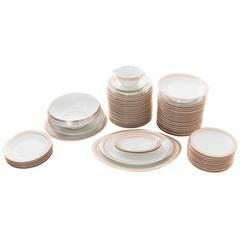 The service count does not include the lids and consists of the following: 60 plates, 8-1/4? – 8-5/8? 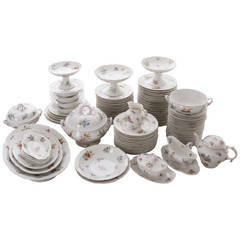 diameter; one is 10-3/8?diameter (23 with chips) 10 bowls, 1-1/2?H x 8-3/4? diameter (2 with chips) 7 short pedestal plates, 1-3/4?H x 8-3/8? diameter (1 with chip) 1 tall pedestal bowl, 6-1/2?H x 9-5/8? diameter 4 tall pedestal bowls, 5-1/2?H x 8-3/4? diameter 5 oval dishes, 1-3/8?H x 9-1/4?W x 5?D 1 large tureen with lid, 10?H x 11-3/4?W x 9-3/4? 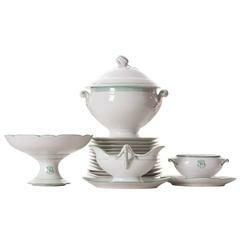 1 medium tureen with lid, 8-1/4? x 10-1/2?W x 8-1/2?D (with chips) 2 two small lidded tureens, 6-1/2?H x 10?W x 8-1/4?D 2 petite lidded tureens, 6-3/4?H x 8?W x 6?D (one missing lid) 1 gravy boat 4-3/4?H x 10-3/4?W x 6-1/4?D 1 lidded saucier, 4-3/4?H x 9-1/4?W x 5-3/4?D. Pair of antique French mid-19th century Old Paris Porcelain from a Louisiana Creole estate.